Product information "Lec R5010w 50cm undercounter"
This fridge is ideal as extra storage space for families who get through lots of chilled goods or for holding the fresh and dairy produce of one individual or a couple in a new flat. At less than 85cm tall it can easily slot underneath most kitchen worktop surfaces to provide that additional space you need. The R5010W is a practical appliance that unobtrusively fits into your kitchen without getting in the way. This is one fridge that won’t let you down; it can keep food chilled for up to 5 hours after a power outage. It’s also very energy efficient which is great for the environment and even better for your electricity bills. It runs at an impressively quiet level so you won’t even notice it’s there until you need it. Most chilled storage units of this kind don’t offer a freezer shelf, but this one does. Located at the top of the refrigerator, it’s big enough to fit in a few pizzas, some ice cream or a bag of oven chips. Best of all is the performance rating of this section; as a 4 star freezer it reaches optimum temperature quickly and can store frozen items for months on end. In addition to the freezer, this fridge has two good sized glass shelves (which can be repositioned as required) and a salad crisper at the base of the product. This section, which is great for keeping items like lettuce and peppers crunchy and full of flavour, is see-through to help you find things quickly. 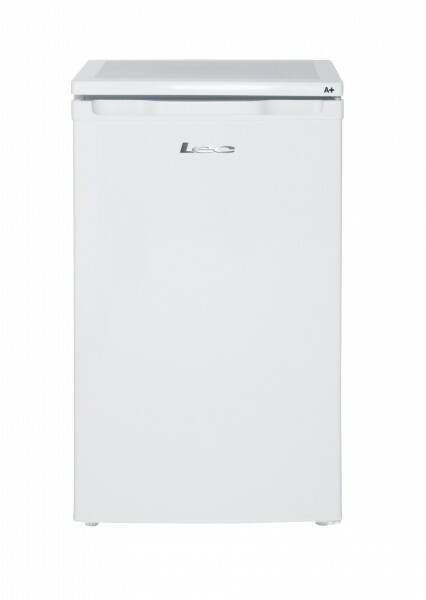 If you’re looking for a cheap fridge that offers great value for money, it’s hard to beat this great Lec home appliance. It’s packed with little features that make it really easy to use, like the interior light, ice cube and egg trays, door storage shelves, bottle shelf, and adjustable feet (which help you ensure you keep the product level). Related links to "Lec R5010w 50cm undercounter"
Customer review for "Lec R5010w 50cm undercounter"